Chicago IL: More Than a Score (MTAS), a coalition of parents, teachers, students and community members working against the misuse and overuse of high-stakes testing in the Chicago Public Schools, is pleased about yesterday’s announcement from CPS CEO Barbara Byrd-Bennett that the NWEA MPG End-of-Year test administration for grades K-2 has been cancelled for this spring. The change in CPS policy is a good, if small, first step towards a sounder, more appropriate CPS assessment policy. We are glad that the voices of the people on the front lines dealing with the consequences of a misguided assessment policy are starting to be heard and heeded. For the past several months, MTAS has been collecting signatures on petitions demanding an end to all standardized testing in Pre-K-2nd grade, among other testing reforms. 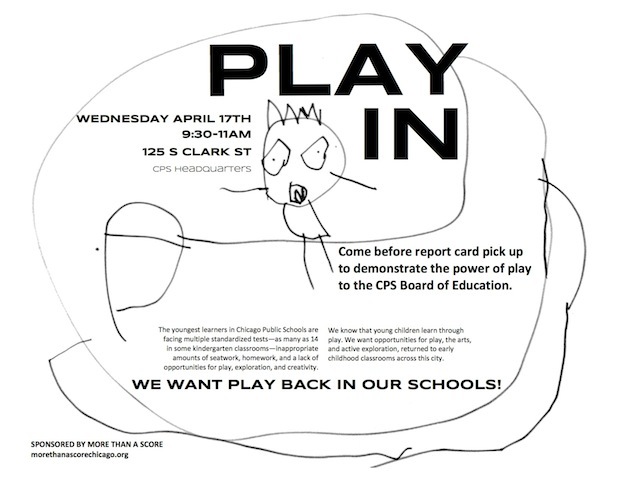 MTAS held a Play-In at CPS headquarters just last week to demonstrate the need for more play and less testing in the early grades. For second graders, the NWEA MPG will simply be replaced with an administration of the NWEA MAP. From our understanding, this is the same assessment used for third graders, and CPS intends to use it to track 2nd graders by ability. According to the NWEA, the test is only for use with 2nd graders who can decode the instructions without audio help. Can all the 2nd graders who will be given this test do this? It will then be readministered to those same 2nd graders in the fall as a Beginning-of-Year exam, making its use as a baseline for 3rd grade instruction questionable. Although the reduction in this test is of a great benefit to five and six year old children, by the end of this school year, many, possibly the majority, of those same children will still have been subject to 13 standardized testing administrations (or more when school-selected exams are included): http://cps.edu/Performance/Documents/SY13PreK-2TrackRAssessmentCalendar.pdf Many of these are require one-on-one testing time by classroom teachers, further cutting into instructional time, particularly in classes of more than 30 students. The value of the NWEA MAP test as an assessment tool is questionable for any grades. Research has found little benefit to MAP guided instruction for 4th and 5th graders: http://ies.ed.gov/ncee/edlabs/regions/midwest/pdf/REL_20134000.pdf. We are concerned that schools do not truly have the technological capacity to administer the MAP test efficiently, particularly in a way that does not restrict use of computer facilities for more important, non-assessment educational purposes. Although MTAS would like to see a reduction (and elimination in the early years) of standardized testing and time spent on test preparation in CPS, the high-stakes consequences of many standardized tests concern us equally as much. Standardized tests should not be used as the basis for decisions on student promotion, teacher and principal evaluation, and school probation and closings. For example, the results of the REACH exam being administered to children as young as preschool will be used to evaluate their teachers. We’re sure we’re not alone in wondering whether reducing the many, many tests CPS now uses by a single test in two grades was worth the resources put into conducting 17 focus groups to come to this decision. In addition, we would like to know whether CPS has already paid for the NWEA MPG spring administration. How much money was wasted on administering an exam on the entire school district twice this year and then deciding it was bad exam? Until CPS starts really listening to the demands of parents, teachers, and students, MTAS will continue encouraging and assisting parents and students in the process of opting out of CPS’ excessive and damaging standardized testing program.